Fish is a delicious, lean protein with healthy fats, but many people are afraid to cook it and save it for when dining out. Whether you avoid cooking fish because you’re concerned about causing a fishy odor in your kitchen (which only happens when the fish isn’t fresh) or the calories of typical breaded and fried fillets, a nifty technique using parchment paper can solve both dilemmas. What’s more, cooking fish in parchment paper also makes for speedy clean-up. Of course, it’s important to start with fresh fish. A white fish like tilapia, readily available at most fish counters these days, should be odorless and have firm flesh that isn’t breaking apart or discolored. Make friends with your fish monger, whether at your supermarket’s seafood counter or a fish store. Regular shoppers tend to get the freshest catch. While you’re at the market, buy a roll of parchment paper. You’ll find it in the baking aisle or the foil and plastic wrap section. Once you have it in your kitchen, you’ll find many uses for it, such as lining baking sheets for roasting vegetables. Here’s how to use it for baking virtually any type of fish. 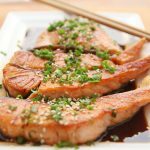 Note: While this recipe is for small individual fillets, you can use a single, longer piece of parchment for larger fillets or even a whole fish. Place both packets on a rimmed baking sheet (for even easier clean-up, line the baking sheet with foil). Note: You can make this up to one hour ahead of time and refrigerate until you’re ready to bake. Bake 8 to 10 minutes.